Amount of trouble saving this whale dialect, is it worth it ? That wouldn't help, because they are two different species and they wouldn't breed but even if they did it wouldn't help because it would be a cross breed. But if they were the same that would work. Anyways its a good effert to help save these endangered animals. If people were more informed and more active about there situation it would be easier for these big guys to survive. Just an idea but mabey somebody could come up with a whale radar system for the people shipping stuff in that area. Kinda like they did with the whole bird plane issue. Who has tried interbreeding North and South Whales ? Perhaps genetic diversity is neded, to smarten them up ? "High numbers of right whales seen in Gulf of Maine"
Dubling how quickly ? Perhaps, soon, run you SUV on RightWhale Oil ? There have been sittings of Whale Sharks(not really whales) Sperm Whales and Killer Whales off of the AL / Ms Gulf Coast in the past few months. I thought Killers were cold water dwellers. 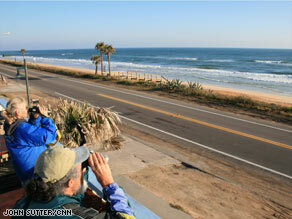 I'll start spending more time at the beach now that theres a possibilty of seeing a Right Whale near inshore. Sand Island is a barrier island that juts out into the Gulf near MobileBay. That would be a great place to set up a Whale watching station. Estimated less than 100 before 1935 - Double every 40 years ? Now that the bad, recessive genes, are gotten over, faster doubling ? "Females reach sexual maturity at 40-45 feet, as early as five years of age. The young right whale stays with its mother for 1 year." "The right whale gestation period is about 12 months"
How soon before RightWhale Cooking Oil ? Could jailbreaking your iPhone land you in jail?